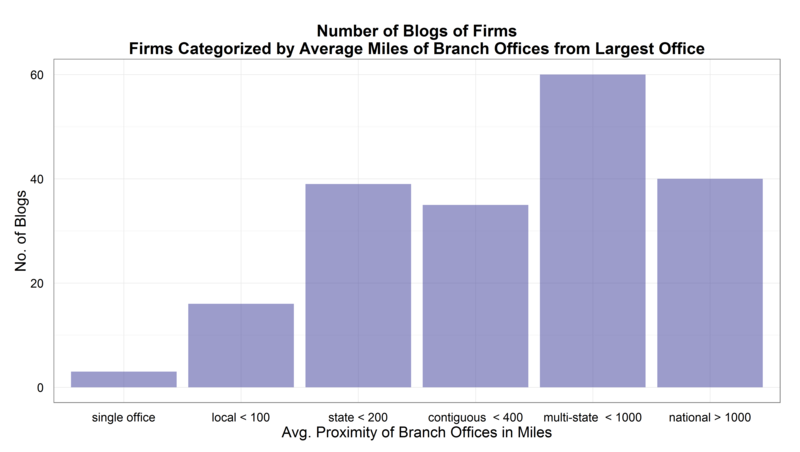 Continuing this series on law firms and their blogs, I hypothesized that firms with wider-spread branch offices would support more blogs. My reasoning was that if your footprint of clientele and prospective clients is broad, you need marketing efforts that reach broadly. Prospective clients everywhere can read blogs so they inherently reach broadly. On the other hand, firms whose offices are clustered more around their largest office may rely relatively more on local marketing. The plot below shows the total number of blogs hosted by groups of firms where the firms are categorized by different average distances of their branch offices from their main office. Single office firms are on the left side of the horizontal X-axis and the short column tells us that they host only 2or 3 blogs. What I termed “local” firms have an average distance of their branch offices from their main office of less than 100 miles: “local < 100”. As a group they hosted 17 blogs. “State” firms have an average distance of their branch offices at less than 200 miles, so I thought of them, roughly speaking, as covering one state. If the average of the firm’s branch offices was between 200 miles and 400 miles, the firm was categorized as “contiguous” since their offices were likely clustered in their home state and bordering states. The category “multi-state < 1000” suggests firms that have established branch offices beyond bordering states, but perhaps not spanning the country, which is what the category “national” firms represents. Of that group, fourteen firms support no blog, as well as I can determine. Those fourteen firms, as they are identified in the plot that follows with shortened names, are Archer Greiner, Boies Schiller, Cahill Gordon, Chapman Cutler, Honigman Miller, Loeb Loeb, Miller Canfield, Quintairos Prieto, Robins Kaplan, Shutts Bowen, Stroock Stroock, Vedder Price, Wachtell Lipton, and Williams Connolly. My hypothesis was that smaller firms would predominate, simply because they have fewer lawyers who might choose to start and sustain a blog. To test this hypothesis, I combined data my blog data set with numbers of lawyers at each firm in 2013, from ALM’s NLJ350 data set. The plot sorts the firms from the smallest at the lower left to the largest at the upper right. Might availability of benchmark metrics cause a “race to the top”? Let’s assume that in the coming years general counsel who give a thought to law department benchmarks can readily find some of those basic metrics. If they can find them without submitting their own department’s data, they may decide not to submit if they know they compare unfavorably. If they foresee, for instance, that their total legal spending is out of line with their industry peers, they may conclude that they should let the sleeping dogs of embarrassing metrics lie. If that decision happens very much, then law department benchmark participants will tip more and more toward those departments that believe themselves are well situated in comparison to the metrics. There will be a “race to the top” where relatively poor performers drop out and benchmarks will become tougher and tougher. They will also grow less and less representative. This would be a shame, because then the entire industry will have nothing but a distorted sense of the typical range of metrics. After all, you would not want to base your sense of body mass index on those BMI metrics gathered only from runners of marathons. Regarding law departments, we often use the term “benchmark metrics” loosely. Start with “metrics.” They are something you can count that exists independently of the counting. The square feet of a law department’s office space is a metric; the amount paid in overtime to secretaries is a metric; the number of law firms retained in Canada is a metric. Before someone measured or counted, the feet, pay, and firms existed. When you collect metrics over time for yourself or from several departments, and calculate the average or median or whatever of those metrics, you have created a benchmark metric. It is a benchmark because you can compare yourself to the pattern of metrics. By contrast, if someone asks law department respondents “Will you increase your office square feet next year?” you can calculate the percentage that reply “Yes” and “No” and “Don’t know” but that finding is not a benchmark metric by my definition. Nothing existed until you asked the question, tallied the responses, and described the distribution of the responses. Similarly, “Please rank the following methods for managing outside counsel costs” does not produce what I think of as a metric, let alone a benchmark. It produces a tally which gives some insight but no comparison.